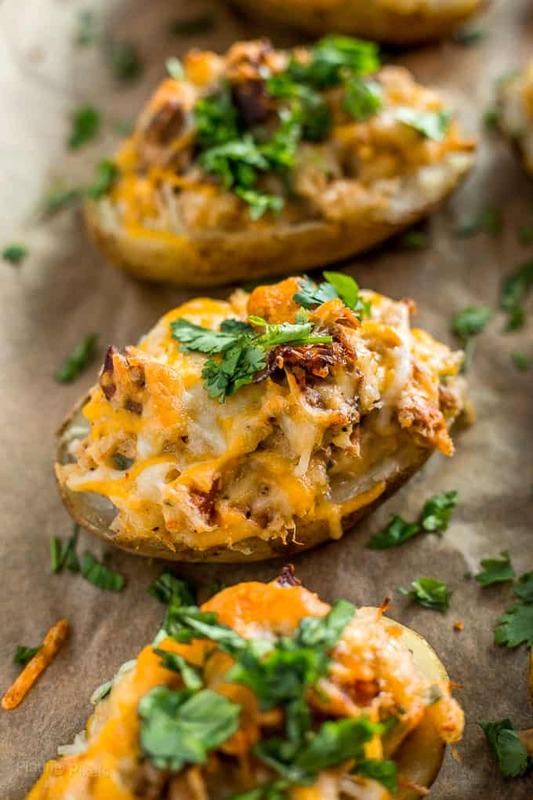 Slow Cooked Carnitas Loaded Potato Skins makes easy, wholesome comfort food. Learn how to make slow cooker carnitas and load it into these Mexican-style loaded potato skins. This is a sponsored post on behalf of Smithfield. All content and opinions are mine alone. With the cooler weather and upcoming holidays, a bit of comfort food is always a good idea. But that doesn’t mean it has to be decadent or unhealthy. 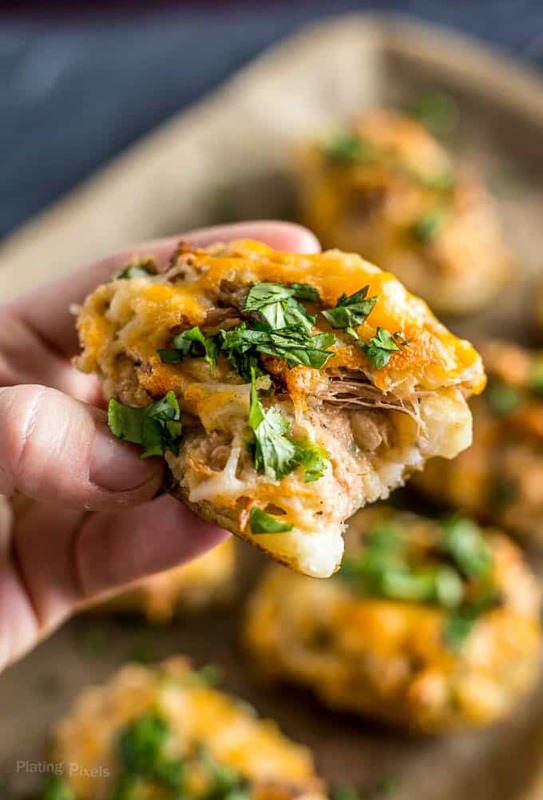 These Slow Cooked Carnitas Loaded Potato Skins are loaded with protein, complex carbs and creamy goodness. Loaded potato skins make a great any day appetizer or unique addition to your traditional holiday spread. 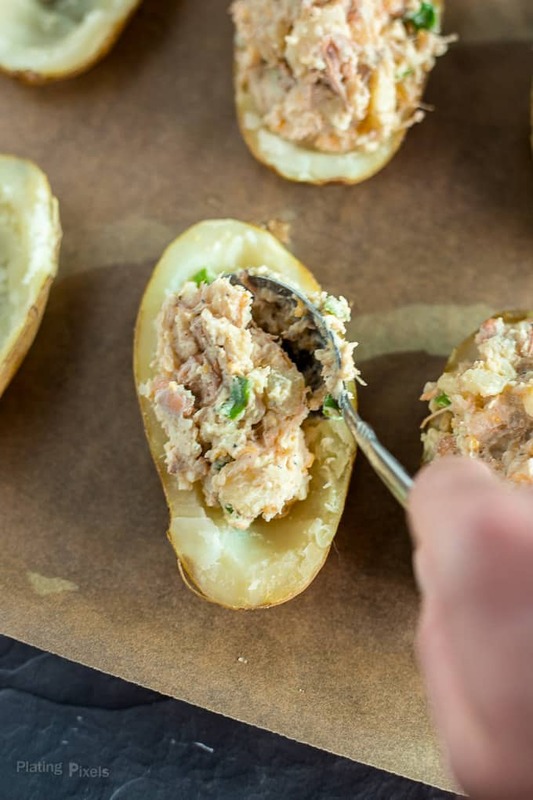 The most common filling for loaded potato skins is scooped out potato flesh, sour cream, butter, milk and/or cheese. Add some variety by adding cooked meats such as carnitas. 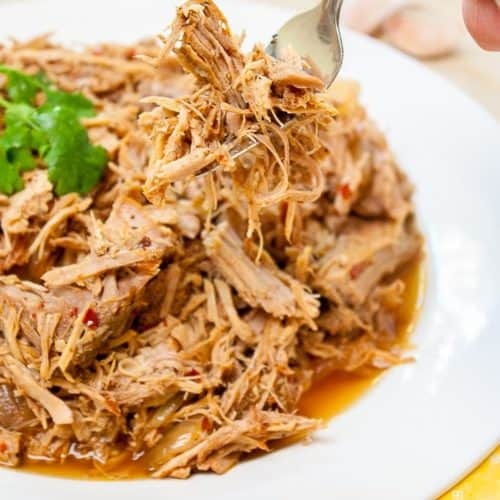 This recipe is Mexican inspired with shredded Mexican cheese, pinto beans, cilantro and tender, flaky slow cooked carnitas. It’s so easy I’ve even made carnitas for breakfast. That’s right, carnitas for breakfast. Learn how with these Carnitas Breakfast Tacos. 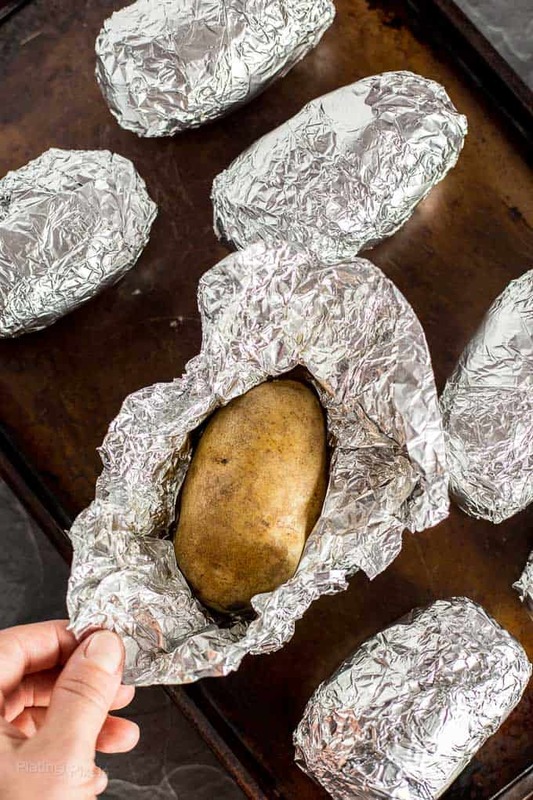 Wrapping potatoes in foil when baking helps them cook faster and stay tender. A few signs they are done is a sizzling sound from steam inside, a nice smell coming from oven, and centers feel soft when poked with a fork. To save time: Microwave the whole potatoes instead of roasting. Heat on high about 10 minutes. Potatoes will be very hot from oven. Cool slightly before removing foil, then again before cutting in half and scooping out flesh. Be sure to leave a thin layer (about ¼-inch) of potato flesh so they hold their shape for filling. Storage: Leftover can be stored sealed in fridge 3-5 days. It’s best not to freeze loaded potato skins and the potato and filling will get soggy when defrosted. Reheating leftovers: Simply bake in oven again 400° F for 10-12 minutes and serve. Roasting potatoes will yield better texture inside and out, but takes a long time to bake. Instead you can microwave potatoes on high for 10 minutes to cook. Then continue to scoop out flesh, combine with desired fillings, and roast prepared potato skins for about 10 minutes to heat and crisp up. This recipe calls for slow cooked carnitas for added unique flavor. It’s easy set-and-forget with minimal cleanup. Slow cooking carnitas on HIGH takes only about 3 hours for perfect, flaky carnitas. 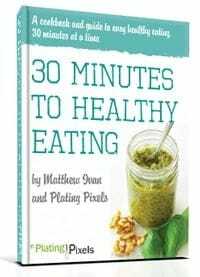 For this recipe, I used the Smithfield Boneless Pork Shoulder Seasoned Carnitas. 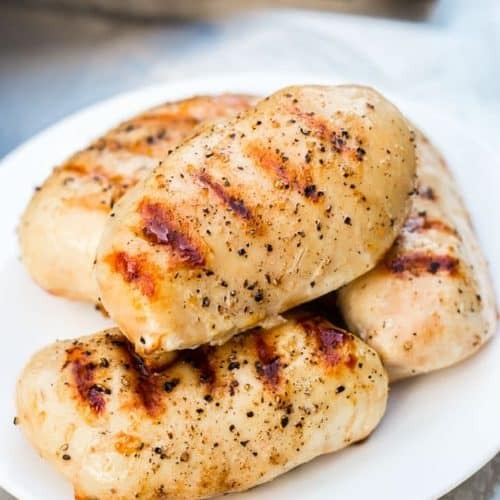 It’s all-natural, packed with protein, and conveniently pre-seasoned, all with no artificial ingredients. This saves lots of time and ensures authentic carnitas flavor in your loaded potato skins. 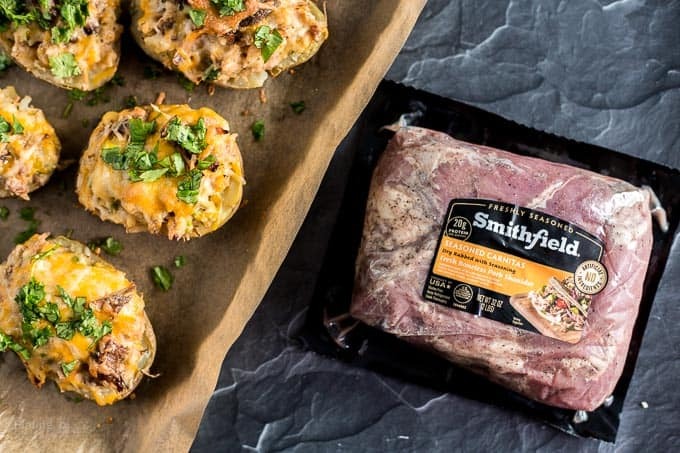 Smithfield’s Seasoned Carnitas is hand trimmed into smaller pieces for quick, convenient cooking. Carnitas is a healthy protein that packs plenty of juicy flavor. One 4-ounce serving of carnitas has 23 grams of protein and only 140 calories. You can find Smithfield Fresh Pork products at Walmart and a variety of local grocery stores. For more healthy recipe inspiration, check out www.Smithfield.com. Cooked potatoes will be slightly squishy when squeezed and fluffy on inside once cut open. 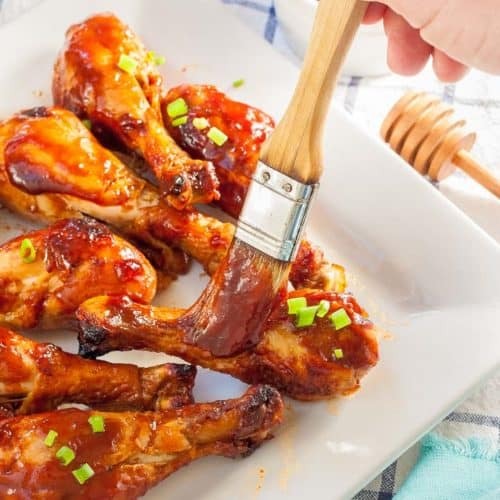 A few signs they are done is a sizzling sound from steam inside while baking, a nice smell coming from the oven, and centers feel soft when poked with a fork. The best way is to bake leftovers in the oven again at 400° F for 10-12 minutes. The skin and cheese on top will get crips again. 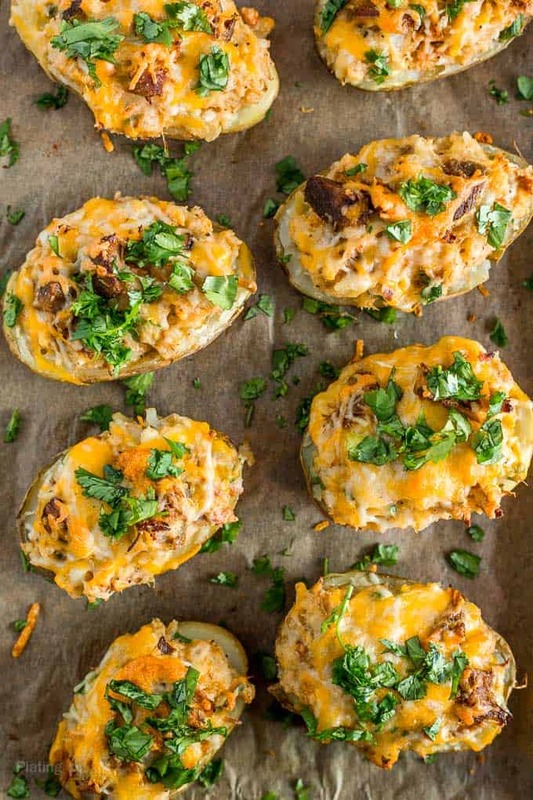 This Carnitas Loaded Potato Skins recipe makes about 12 to 16 potato halves, depending on size of original potatoes, so you may have leftovers. It’s perfect for holidays, gatherings or even family dinners. Loaded potato skins with shredded Mexican cheese, pinto beans, cilantro and tender, flaky slow cooked carnitas. Place boneless pork shoulder pieces in even layer in a slow cooker. Add onion and water. Cover and cook on LOW for 8 hours or HIGH for 3 hours. Remove carnitas and onion from slow cooker with slotted spoon and discard liquid. Use a fork to shred carnitas into smaller pieces. Set aside. About 1 hour before carnitas is done: Preheat oven to 400° F. Wash potatoes, poke both sides a few times with a fork, then tightly wrap each in foil. Place on a baking sheet and roast 40-50 minutes, rotating halfway, until cooked and tender. Remove from oven, let cool slightly, then remove foil. Cool potatoes 10-15 minutes, slice in half. Cool longer if centers are still too hot to touch. Use a spoon to scoop out center of each potato half, leaving some flesh, into a large bowl. 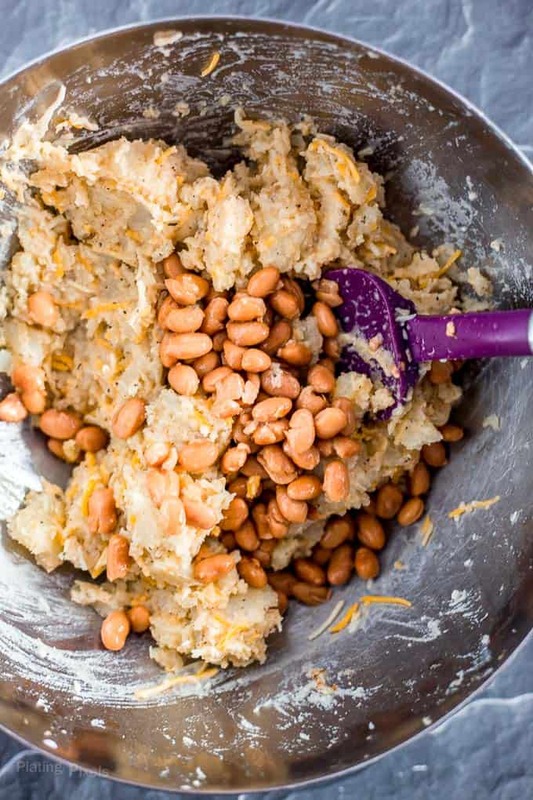 Use a potato masher to soften. Set skins aside. Add 1-½ cups cooked carnitas, 2 cups cheese, sour cream, beans, milk, green onion, chili powder, salt and pepper to bowl. Stir until combined. Scoop mixture into center of potato halves, creating mounds on each. Sprinkle tops with desired amount of shredded cheese. Place on foil lined baking sheet and roast at 400° for 10 minutes, or until center is warm, and cheese is melted and golden. Cool slightly and top with cilantro and extra sour cream before serving. Recipe will provide extra carnitas. Add more to potatoes skins if desired, or use for leftovers or another recipe. To save time: You can microwave the whole potatoes instead of roasting. Heat on high about 10 minutes, skipping step 3 in instructions. Storage: Leftover can be stored sealed in fridge 3-5 days. Freezing not recommended as the potato and filling will get soggy when defrosted. How to reheat leftover loaded potato skins: Simply bake in oven again 400° F for 10-12 minutes and serve. Oh wow, I love carnitas and I love potatoes, so this is a recipe to try ASAP! Haha well said Sherri. Thanks! 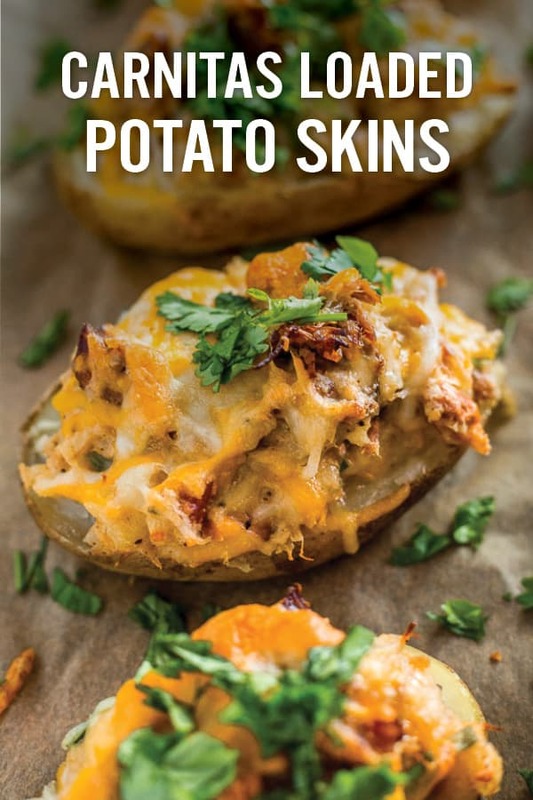 These look like they would make an amazing game day food! This might be the best thing I’ve seen ALL day! The ultimate chilly fall day comfort dish! These potatoes are totally calling my name! Saving them for dinner this week!